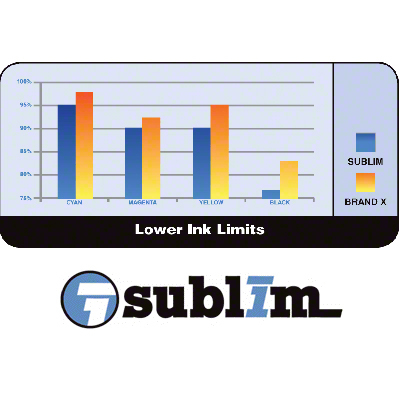 Light Cyan, SubliM™ Sublimation Ink; Liter, 1000ml; For Epson, Mutoh, Mimaki and Roland High Speed Wide Format Printers. Ideal for high-speed digital printing of sublimation heat transfers for both polyester fabrics and polyester-coated hard surfaces. From superior color vibrancy, image quality and ink yield, to reduced maintenance and trouble-free unattended printing, SubliM delivers an industrial solution for your business. Please contact Technical Support for templates of this product. There are 129 blogs posts about this product. Special Feature Article - 100 Top Tips and Tricks for Sublimation Success! Adding images with dye sublimation to a door hanger. How to add images with sublimation to carpet squares. For Dye Sublimation, What Heat Press Should you Buy? Want to Sell More Dye Sublimation Name Badges? Dye Sublimation Heat Press Maintenance: When is 400Â° REALLY 400Â°? Dye Sublimation Business ~ Attention Laser and Rotary Engravers!! Dye Sublimation Business ~ Do You Know What EMV Is? Dye Sublimation Business: Door-to-Door Still Works! Why Do I Have a Red Light on My Dye Sublimation Printer!?! Dye Sublimation Glass Nail Files Make Great Gifts! For Dye Sublimation Businesses: Why Follow Through? What Kind of Software Should You Use for Dye Sublimation? Advice for Dye Sublimation Business Owners: Back it up! Sublimation Success . . . by Failing? Your feedback is important to us! Complete this form below and you'll be entered into our weekly prize drawing to win a $25 Conde Account Credit! A lucky winner will be drawn randomly every week and notified by your account representative.